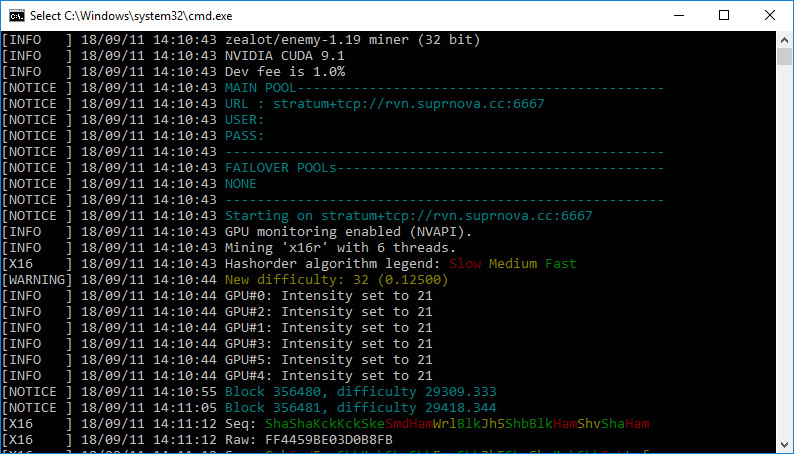 One more update for the zealot/enemy miner aka z-enemy 1.19 that adds some extra performance improvement of about 5-7% for the supported algorithms like X16, X17, Bitcore, C11, Hex and so on. The new version also brings additional stability improvements, so if you are having trouble with a previous release, you should definitely try the new one. Do note that the 32-bit vrsion does seem to be faster in some algorithms compared to the 64-bit release, but you better test yourself on your own hardware. The latest z-enemy version 1.19 is available for CUDA 9.1 and 9.2 for both 32-bit and 64-bit Windows versions as well as CUDA 9.0, CUDA 9.1 an CUDA 9.2 binaries for Linux (HiveOS, PiMP OS, EthOS & Ubuntu). Do note that for maximum performance it is recommended to have the latest drivers installed (ver. 398+). We remind you that z-enemy is a closed source miner available only as a binary release and it contains a 1% developer fee built-in to support further software development.